A herniated disc, also called a bulging disc, ruptured disc or slipped disc, occurs when the inner core of the spinal disc pushes out through the outer layer of the disc. Herniation describes an abnormality of the intervertebral disc that is also known as a “slipped,” “ruptured” or “bulging” disc. This process occurs when the inner core (nucleus pulposus) of the intervertebral disc bulges out through the outer layer of ligaments that surround the disc (annulus fibrosis). This tear in the annulus fibrosis causes pain in the back at the point of herniation. If the protruding disc presses on a spinal nerve, the pain may spread to the area of the body that is served by that nerve. Usually, the main symptom is sharp, acute pain. In some cases, there may be a previous history of localized low back pain, with pain also extending down the leg served by the affected nerve. This pain is usually described as a deep, sharp pain, which gets worse as it moves down the affected leg. The onset of pain with a herniated disc may occur suddenly or it may be preceded by a tearing or snapping sensation in the spine, which may be attributed to a sudden rupture in the annulus fibrosis. 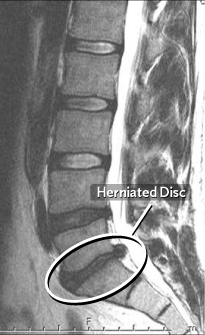 A patient with a herniated disc will usually complain of low back pain that may or may not radiate into different parts of the body, such as the leg. They will often demonstrate a limitation in range of motion when asked to bend forward or lean backwards, and they may lean to one side as they try to bend forward. Patients will sometimes walk with a painful gait, flexing the affected leg so as not to put too much weight on the side of the body that hurts. Straight leg raising may be a positive indication of tension on the nerve root. Abnormalities in the strength and sensation of particular parts of the body that are found with a neurological examination performed by a doctor provide the most objective evidence of nerve root compression. An MRI is the test of choice for diagnosis of a herniated disc, but a CT scan (CAT scan) also may be helpful because it provides better visualization of the bony anatomy of the spinal column that indicates where the source of pressure on the nerve root is located. Treatment for the vast majority of patients with a herniated disc does not normally include surgery. Most patients will respond to conservative therapy, such as medication, rest and physical therapy. Treatment is most effective when a patient and a doctor have a good relationship and the patient understands the rationale behind the prescribed treatment. The primary element of conservative treatment is controlled physical activity. Usually treatment will begin with a modification of activity and then a gradual return to protected activities. Sitting, bending, lifting and twisting are not beneficial for this condition because they put a large amount of stress and pressure on the lumbar spine, which may increase the pressure on the affected nerve root. The appropriate use of medication is an important part of conservative treatment. This can include anti-inflammatory drugs, analgesics and muscle relaxants. Your doctor also may recommend an anti-inflammatory spinal injection for the area of the affected nerve root to lessen swelling and irritation caused by the damaged disc. Surgery is typically recommended only after physical therapy, rest, and medications have failed to adequately relieve the symptoms of pain, numbness and weakness over a significant period of time.